BEGINNING OF THE ANTHROPOCENE I copy of J.M.Turner's 1838 "The FightingTemeraire"
91 x 122 cm: internet download, inkjet plotter paper and ink. original: The Fighting Temeraire tugged to her last berth to be broken up, 1838 J.M. William Turner, 91 x 122 cm, National Gallery, London. The painting is said to represent the end of England as a naval superpower: the Fighting Temeraire, a ship that had a decisive role in the battle of Trafalgar, is tugged away to be broken up. 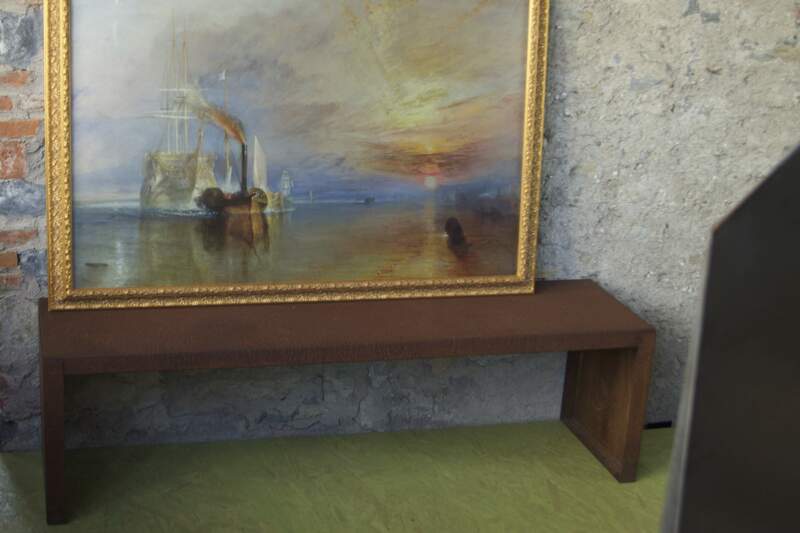 The painting is also said to represent the end of the painter himself, Turner, who was in his sixties when painting it. Less known is the view that the painting represents the industrial revolution; the transition towards a world of coal and steel, machines and smoke: the beginning of the Anthropocene.